The man-made fibers are spun from polymer solutions basically by the following three methods in textile industry. Those are dry spinning method, wet spinning method and melt spinning method. A brief discussion about the three mentioned spinning methods for man-made fiber spinning are discussed in this article. One of the three spinning methods for spinning man-made fiber is dry spinning method. Fibers produced by this technique are acetate rayon, acrylic fiber etc. In this process, fiber forming materials are dissolved in volatile solvent. Each spinning unit consists of a pump and spinneret at the top of a tall shaft about 9-15 feet high. There is an air outlet at the top of the tall shaft and air in let at the bottom. The spinning solution is forced under pressure from the storage tank to the spinning pump and then through the spinneret. The number of holes, diameter of holes and shape of the holes varies according to the requirements of a spinneret. The fineness of the filament is determined partly by the diameter of the holes but primarily by the relation between the rate at which solution is forced through the spinneret and is at which the yarn is wind-up. When the spinning solution emerging from spinneret meet the worm air, violate solvent evaporates leaving the filaments. Hence, coagulation takes place and becomes dried before leaving the chamber. In this method, the common man-made fibers spun are viscose rayon, alginate, acrylic fibers etc. 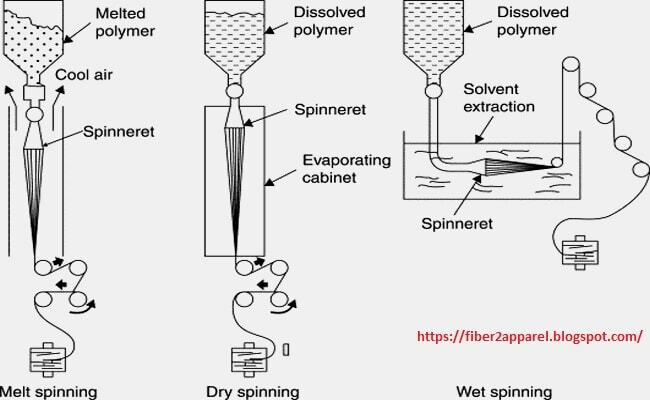 the fiber forming polymer solution first de-aireted and then pumped under pressure through metering pump unit, then through the filter and finally through the spinneret. The spinners are immersed in a spin bath containing coagulating fluid at a reasonable temperature. It becomes coagulated by the chemical of the spin bath as the polymer solution goes out from the spinneret and travel through the bath. Diameter of holes, rate of solution feeding and the rate of taka-up determines the fineness of filaments. The number of holes per spinneret may be 100000 numbers per square inch. Diameter and space of holes in the spinneret could be varied. In this technique, the common man-made fibers spun are nylon, polypropylene, polyester etc. the fiber forming polymer chips are fed through a hopper into spinning vessel. In textile spinning ewer, melts by the heated grid and passes through the grid mesh and collected on the pool. Then the melt is metered by a pump through a filter and finally through the spinneret. The melt solidifies immediately it issues from the jets and so form filaments passes through a cooling chamber in which cold air current swept across the filaments. The spinning speed is approximately 1200 meters per minute. It avoids the need for a solvent recovery plant and loss of solvent during recovery. The high spinning speeds that is possible.